The ability to control the structure of polymers has long been the holy grail of the polymer scientist. In particular, the use of readily applied synthetic methods such as free radical techniques has been a much sought-after goal. In the 1970s, Dave Solomon established a group in his Division of CSIRO which achieved this goal. They rewrote the theory of radical polymerisation and in their studies developed a method to grow polymer chains in a controlled manner. The technique, known as nitroxide mediated living radical polymerisation (NMP), was the first of the modern methods of controlling radical polymerisation. The other two methods are Atom Transfer Radical Poymerisation (ATRP) and Reversible Addition-Fragmentation Chain Transfer (RAFT). RAFT Polymerisation is also a CSIRO discovery. NMP has opened up enormous possibilities for specialty polymers useful in a wide range of applications. The patent covering this work by Solomon, Rizzardo and Cacioli, 1986, was in the top 10 most cited patent in Chemistry and Related Science from 1999’2005, and was the most cited patent in 2002, according to the Chemical Abstracts Service (CAS), a Division of the American Chemical Society (ACS). The established theory at the time held that the process of radical polymerisation, once started, would continue until its natural conclusion, and that control of the process was not possible. Indeed, the ability to control free radical polymerisation was perceived as something of a holy grail ‘ extremely beneficial and desirable, but totally unattainable. In the early 1970s, Dave Solomon’s group had been synthesising polydiallylamines for use in the SIROTHERM process for desalting brackish water. They were able to show that the structure of the polymer was at variance with that predicted by the existing theory, which was based on the assumption that given alternative possible pathways in the formation of the polymer, the most stable structures, a six-membered ring, would be formed. In a series of publications with Geoff Hawthorne, they showed conclusively by the use of models, by trapping with excess initiator and then by NMR of the polymers, that exclusive formation of five-membered rings occurred (Scheme 1). Scheme 1. Cyclopolymerisation of 1,6-Diallylamines. This finding was a major step on the path to rewriting the theory of radical polymerisation. Thermodynamic control was not dominant ‘ kinetic factors were of greater significance. As Joseph P. Kennedy, who is best known for his contribution to ionic polymerisation, said to Dave, It’s back to the drawing boards for free radical chemistry! With Graeme Moad, Dave published a reference book on this fundamental change to our understanding of radical polymerisation [Moad and Solomon, 1995]. This work and the renewed interest in radical polymerisation were major factors that allowed Dave to form the Polymer Research Group in the CSIRO Division of Applied Organic Chemistry. The removal of the shackles of the entrenched theories meant that a ready explanation for the previously noted differences of apparently similar polymers was available. The term ‘defect groups’ was introduced and these were the areas in the polymer molecule where, for example, degradation might start. A major study of defect groups was commenced and first focused on the initiation step, with later studies on termination and then propagation. The emphasis was on the chemical structures formed and their effect on the polymers’ properties. Other research groups were tackling the study of initiation using ESR and, for example, nitroso compounds to trap the radicals as nitroxides. ESR had an advantage in that it was rapid, but Dave’s group reckoned it lacked the sensitivity necessary to detect minor pathways. Therefore, they decided to search for a radical trap that would enable them to isolate and quantify the products. With Geoff Hawthorne, Dave had previously used the stable free radical 2,2-diphenyl-1-picrylhydrazyl(DPPH) as a trap, but the chemistry of this trapping was not straightforward. They needed a trap that would add cleanly. Alkoxyamines were, and still are, used as stabilisers in polymer composites and nitroxides were known to be inhibitors of radical polymerisation. So they chose TEMPO (or 2,2,6,6-tetramethylpiperidinyl-1-oxy) (1), a nitroxide that combines with carbon centred radicals to yield ‘stable’ alkoxyamines, as their trap. Later, they were to extend the range of nitroxides, including the new isoindoline nitroxide (2). This proved invaluable because the aromatic ring allowed easy detection of the separated alkoxyamine by UV spectroscopy [Griffiths, Rizzardo and Solomon, 1982-a]. Details of this extensive nitroxide trapping work are published and reviewed in Solomon and Moad, 1987. The structures of these molecules are shown in Scheme 2. Scheme 2. (1) TEMPO and (2) 1,1,3,3 tetramethylisoindolinyl-2-oxy. A number of observations were to lead to the discovery of nitroxide-mediated living radical polymerisation (NMP). One of the first systems Dave’s group studied in detail using nitroxide trapping is shown in Scheme 3 [Griffiths, Rizzardo and Solomon, 1982-b]. Scheme 3. Products from the reaction of tert-butoxy radicals with MMA in the presence of (2) at 60 °C. Compound (6) is of interest since there are two explanations for the way in which it formed. Either radical formed by abstraction from the methyl of the ester is significantly more reactive than the other radicals, or the alkoxyamine first formed (5), which is much less stable than the other alkoxyamines, and dissociates, adds monomer and is then trapped as (6). A second observation was that during isolation and purification of the alkoxyamines, the characteristic nitroxide colour was observed, for example during recrystallisation. And thirdly, in the specific case of the trapped dimer formed in the thermal polymerisation of styrene, Graeme Moad had observed changes in the cis-trans ratio (Scheme 4) [Moad and Solomon, unpublished observations]. Scheme 4. Cis-trans isomerisation of styrene-dimer/nitroxide. Initially, this thermal instability was a problem, but they then realised its potential as a means of controlling termination. In 1984, they filed a patent which described nitroxides and alkoxyamines as a route to controlling the growth of radical polymerisation [Solomon, Rizzardo and Cacioli, 1986]. The term ‘living’ was used in this patent. The alkoxyamine could be an isolated and purified compound or it could be formed in situ; mixtures of the alkoxyamine and nitroxide were also used to minimise thermal polymerisation. While the patent focused on low molecular weight polymers, it also gave examples of polymers with up to 230 repeat units (MW = 23 000). Table 1 summarises the examples of homo, co and graft polymers that were described. Later they were to use NMP to prepare microgels and star polymers [Abrol et al., 1997]. Table 1. Examples of homo, co and graft polymers described in the patent. The variation in alkoxyamine stability with monomer structure was also used to locate specific monomer residues as chain ends. For example, in styrene ‘ MMA copolymerisation it is possible, by controlling the temperature, to have all chain ends as styrene units since the alkoxyamine from styrene is more stable than that from MMA. This provides a means of locating functional groups at chain ends by the use of substituted styrenes [Moad and Solomon, unpublished observations]. The molecular weight distributions (MWDs) of most of the examples in their patent was broad, but Graeme Moad recognised the potential of this living system to prepare narrow polydispersity polymers by NMP. The theoretical requirements for narrow MWD were published [Johnson et al., 1990] and have since been demonstrated in a variety of systems by many workers [Georges et al., 1993, Macromolecules, 26, 2987]. Despite extensive publication of this original work, NMP received scant attention until Georges et al. [Georges et al., 1993, Macromolecules, 26, 2987] used NMP to prepare narrow polydispersity polystyrene. There followed a period of intense interest in NMP. Hawker [Benoit et al., 1999 J. A. C. S. 121, 3904; Hawker et al., 2001, Chem. Rev. 101, 3661] added to the range of suitable nitroxides and polymer structures. Thus, NMP enabled the synthesis of a range of polymer structures not previously attainable by radical chemistry became commonplace. The original CSIRO alkoxyamine/nitroxide patent has expired and is no longer an issue in commercialisation by others. We can confidently expect increased activity as commercial systems become realities. More recently, Atom Transfer Radical Polymerization (ATRP) [Kamigaito et al., 2001, Chem. Rev., 101, 3689; Matyjaszewski and Xia, 2001, Chem. Rev., 101, 2921] and Reversible Addition’Fragmentation Chain Transfer (RAFT) [Moad et al., 2003] have added to the tools available for the scientist to conduct living polymerisations. Whilst NMP, ATRP and RAFT each have their virtues, combinations of these techniques and the interconversion of one form to another are opening exciting possibilities for the synthesis of highly controlled polymer structures by radical polymerisation. While generally better known for the invention of the plastic banknotes, Dave Solomon is more proud of having established the controlled or living free radical polymerisation theory of polymerisation, described as one of the most startling and unpredicted discoveries in polymer chemistry. This groundbreaking discovery totally changed the way scientists and engineers approach free radical polymerisation. But it’s obvious which one is easier to explain when you’re down at the pub, he confesses. Dave has summarised this discovery in the Highlight/Review article he wrote for the Journal of Polymer Science in 2005 [Solomon DH, 2005, ‘Genesis of the CSIRO polymer group and the discovery and significance of nitroxide-mediated living radical polymerization’. J. Polymer Sci. : Part A: Polymer Chemistry, 43, 5748-5764]. 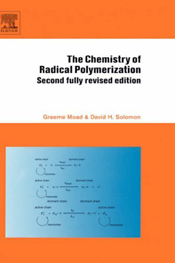 Front cover of the 2nd Edition of The Chemistry of Radical Polymerization by Graeme Moad and David Solomon, published by Elsevier in 2005.